Let us seek the comfort and perseverance of the person of the Holy Spirit. For whatever things were written before were written for our learning, that we through the perseverance and comfort of the Scriptures might have hope. Now may the God of patience and comfort grant you to be like-minded toward one another, according to Christ Jesus, that you may with one mind and one mouth glorify the God and Father of our Lord Jesus Christ. Romans 15:4-6. Comfort, paraklesis; Strong’s #3874. A calling alongside to help, to comfort, to give consolation or encouragement. The paraklete is a person who is a strengthening presence, as well as a resident within born again believers. He upholds those who continually ask Him for assistance. 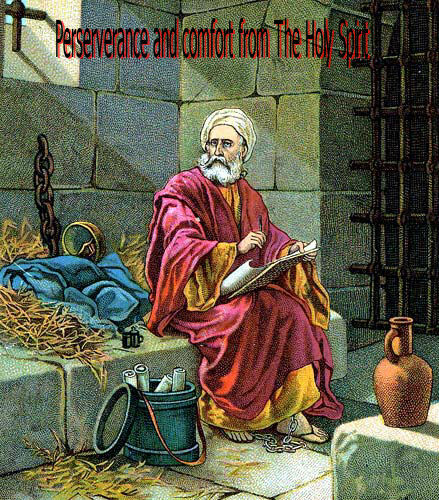 Paraklesis (comfort) can come to us both by the Holy Spirit (Acts 9:31), and by the Scriptures (Rom. 15:4). Previous Are you saturated with the blessings of the Lord? Next God Welcomes U Turns. I was taught as a youngster that the paraklete was identified with the Holy Spirit, our Great Comforter. Now I know that the word comes from the Greek word paraklesis. Thank you for another illuminating word study.